We can all heave a sigh of relief now that January is over. The bluest month of the year has been and gone and most of us have done well to survive the longest pay gap of the year. 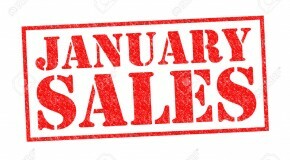 However, one of the few perks of this past month isn’t quite over yet – the January sales. Booking holidays and making big purchases for ourselves and our homes requires a cash surplus, which is not available to most in January after the Christmas binge. When digging deep into our own pockets isn’t possible, forms of alternative finance may need to be sourced. Fortunately, with the range of options now available, there is no reason for anyone to miss out on the last weekend of sales. Hitachi Capital tracked successful finance applications made by retailers on behalf of customers in 2016 and found that January had the most, 34% higher than the monthly average for the rest of the year. Retail credit empowers consumers to make the most of the sales, purchasing what they want while being able to pay the money back in manageable amounts over an extended period of time. Customers shopping during the imminently concluding sales period can ultimately save themselves money by acquiring items at a reduced rate, rather than purchasing later in the year when stock is at full price. Have a considered approach for sales periods to help avoid impulse buys. Rather than unnecessarily splurging on new clothes, you can instead invest in an expensive sofa or buy family gifts for later in the year. A lot of products are marked down throughout the year so don’t feel like you have to buy something just because it’s got a big sale sticker on it. Also consider that some items may be cheaper during later sales periods e.g. May for outdoors equipment and spring clothing, and November – specifically ‘Cyber Monday’ – for electronics. Only buy what you can afford. The best way to use credit is arguably for a single, one-off and defined purchase. By picking a deal which offers 0% on new purchases for as long a period as you’re eligible to qualify, and doing some careful planning, it is possible to borrow at no cost. Above all else, make sure you take out a manageable loan which works for you. While the stated deadline for many sales may be on a Sunday, retailers often extend these periods so it is worth keeping an eye out. You can do this by subscribing to various newsletters as well as bookmarking online retailers’ pages. Finally, why not cut back on the alcohol intake this month or cycle to work to avoid transport costs?